Originating from Northern Thailand, sticky rice is whiter and shorter than other rice. This opaque grain becomes translucent when cooked and is best prepared by soaking prior to cooking to capture that authentic Thai taste. Real Thai. Gluten free. No artificial colours, flavourings or preservatives. 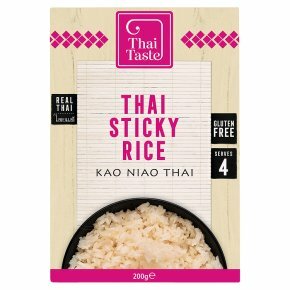 Suitable for vegetarians & vegans.Originating from Northern Thailand, Sticky Rice is whiter and shorter than other rice. This opaque grain becomes translucent when cooked and is best prepared by soaking prior to cooking. Widely served as an accompaniment to savoury dishes, it is also very often cooked with coconut milk and a wide variety of fruits to create sweet snacks or delicious desserts. For a delicious dessert, try it with Thai Taste coconut milk! Suitable for microwave cooking. For 4 people.Serve hot or cold. Put 200g of sticky rice and 300ml of water into a saucepan and bring to the boil.Cover and simmer gently for 10-15 minutes until water is absorbed.